Sadly, the Castle is another of Kendal's inns to fall by the wayside, succumbing to economic pressures of a failing high street. That said, the inn appears to have been in existence for a number of years, Brendan Jameson told me that he had information that the inn had been on Castle Street since the early 1700s, though written records only mention it from around 1834. An article from the Westmorland Gazette in 1882, notes "In Peat Lane or Castle Street is an old established inn which was first kept by James Allen, then Thomas Russell. He was succeeded by his widow, then their son Richard took over. In 1882 the Landlord was James Bateman. It has never, to our knowledge, displayed a pictorial sign. In 1874 this house was advertised to be let and was described, together with its surrounding, as "all that ancient common garden with the dwelling house." The dwelling house has recently been put to good repair and in the garden is a good bowling green"
John Todd's map of 1787 doesn't show any buildings in this general area, just empty river side or open fields. Above. 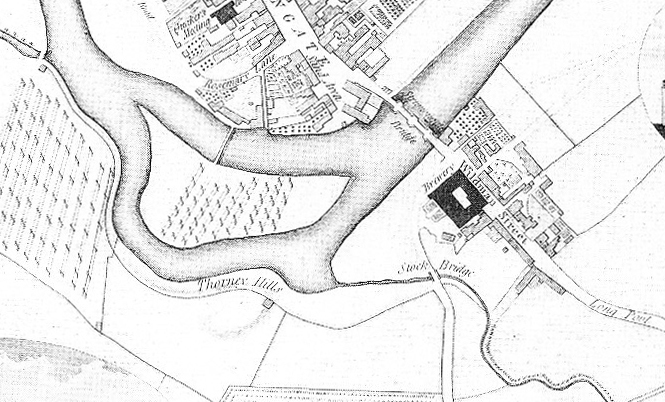 John Todd's map, showing Wildman Street, but no sign of Castle Street. 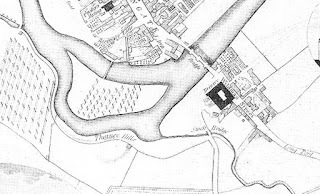 The early to mid 1820s was when some building started to appear in this area, and John Wood's map of 1833 shows a number of buildings here, but if the Castle Inn was built at this time, we have no way of knowing. James Gandy, a wealthy local wool merchant, sold land for the building of Castle Street, where a plot of 594 square yards was conveyed to John Rudd, a Kendal weaver, in 1826. In 1849, James Tate was listed in Borough records, as landlord. In 1858, Thomas Russell was landlord. In 1897, the Castle inn was owned by Kendal brewers Messrs. Alexander and Sons Ltd.
Of course, those of us who frequented Kendal on a Friday or Saturday night would often pop in for a pint or two when Des and Babs Airey were landlords....but that's all in the dim and distant past now!